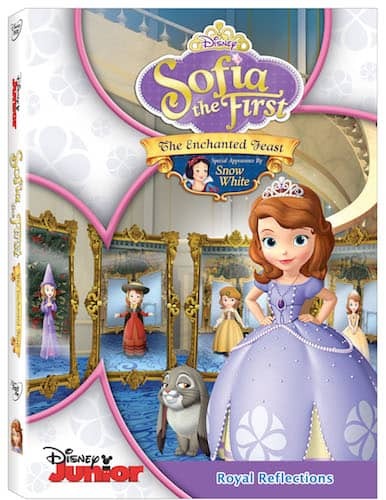 Sofia the First: The Enchanted Feast is the newest Sofia the First film available on DVD! I received the DVD along with a few products from the Disney Store so my little ones and I could celebrate the movie release with our own Enchanted Feast! While Haiden was excited that Piper had some fun accessories to add to the purple princess dress already in her closet, he did seem a tiny bit sad that he didn't have anything new to wear. When I asked him if he wanted to be a pirate, he jumped up and ran to get all of the pirate items he had just brought home from a birthday party a few weeks ago! After their feast we settled in to watch Sofia the First: The Enchanted Feast for the first time. There's more than meets the eye when you join SOFIA THE FIRST for a royally scrumptious adventure! First, Cedric will conjure up a fabulous feast. Next, he'll transform the banquet room into a hall of amazing “morpho-mirrors.” But before the fun begins, wicked Miss Nettle (disguised as “Sascha The Sorceress”) crashes the party with a scheme to steal Sofia's magical amulet. 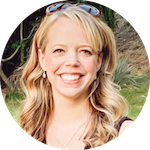 Can Sofia foil the bad fairy's plan before it's too late? Perhaps…with help from Snow White, who reminds her it's important to trust your instincts. Sparkling with music and excitement — plus four more spellbinding episodes — THE ENCHANTED FEAST may be the fairest of them all! The DVD features an episode with a special appearance by Snow White, plus four additional episodes and a FREE enchanted mirror! I fully admit that I get a little bit excited to have a new look at the special Disney princess featured in every Sofia the First DVD set (you know how much I loved seeing Ariel in Sofia the First: The Floating Palace!). It was heartwarming to see Snow White give Sofia valuable advice about trusting her instincts and telling others if something or someone doesn't seem quite right. 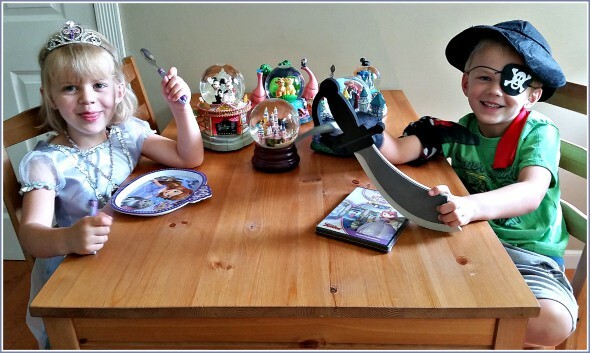 Who wants to win a Sofia the First: The Enchanted Feast gift pack featuring the DVD and items from the Disney Store? Disclosure: The prize pack and items provided to facilitate the review/giveaway were received at no cost to me. 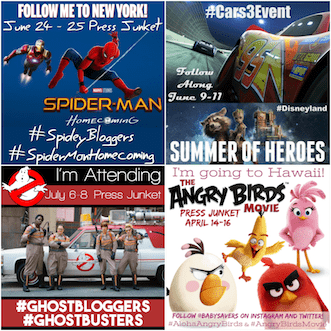 All items provided by Disney and/or the associated PR company. What a great giveaway! My daughter loves Sophia and would be thrilled to open this on Christmas! my daughter is obsessed with sophia the first! her whole room is decorated in sophia and i would love her to have this for her birthday next month!!! I’d love to win it because my daughter is a Sofia the First fan. I would like this for my daughter. She would love the movie and also the necklace and tiara. 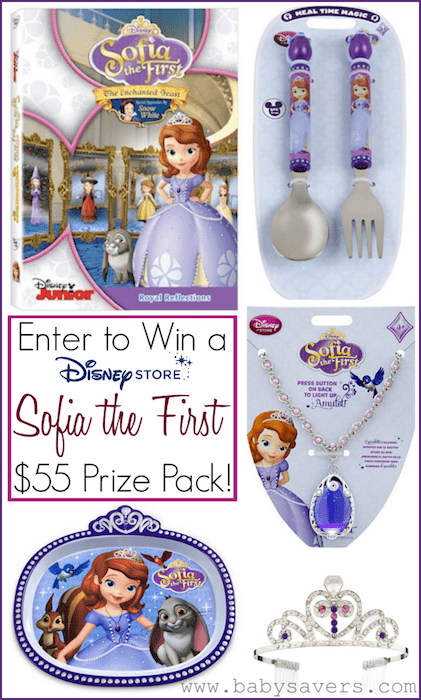 My daughter would love to win this Sofia prize pack. She loves watching Sofia! My daughter loves Sophia and an extra set of silverware is always nice to have! I would love to win this prize to give to my niece. I like to win this because my daughters love Sophia! I would LOVE to win this for a certain little Arianna! She has a princess name and she sure LOVE Sophia already. She would love to get this for her birthday coming up. I hope I win. i love the fork and sppon set idk what happend to ours! I would love to win this for my granddaughter,shes loves Sofia. I would love to win this for my daughter and start getting her into cartoons she might like! I would love to win this for my little niece, she is a great Sophie fan. MY DAUGHTER WOULD BE EXSTATIC! My daughter would freak out over this! I’d love to win because my daughter would LOVE these items! Thank you for offering the chance to win. My granddaughter will be turning one soon and I think that she would love this……she is my first princess! A GIFT TO make a little girl feel like a princess just like Sofia!!! My daughter would live this prize pack! I’d love to win for my niece….this is one of her favorite shows! My daughter would think I am the coolest Mom ever if I won this for her!! My daughter would love anything Sofia! Its the only Disney princess I let her watch!! I would like to win this for my great granddaughter she loves Disney so much. My daughter loves Sofia the First! I have a niece that i don’t get to do much for because she lives so far away, i would love to include this in a gift box to send to her. I would love to win because I know a little girl who would love this. I would love to win this as my nieces birthday is coming up and this would be a great gift for her. She has always loved Ariel and then it moved onto Sophia. Such a cute show. I love that Sofia is a great role model for kids- she is kind to her friends and to animals. I am working on building my Christmas Closet, and saving presents for Christmas. I would freak out if I won this one. I want to win this one for my friends little’s one for her birthday.